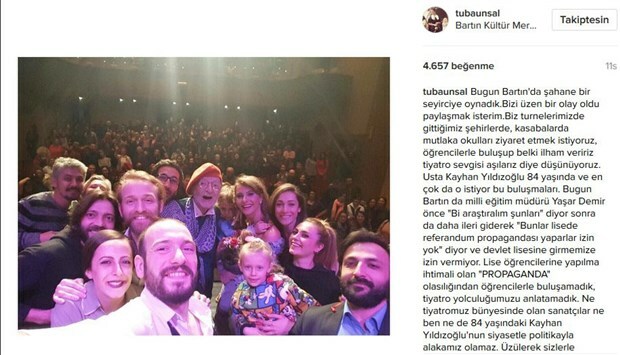 Turkish actors Kayhan Yıldızoğlu and Tuba Ünsal was denied permission to make a drama-related speech at a local high school in Bartın province as the city’s national education director feared they would make propaganda on behalf of the “No” front before the presidential referendum. “We performed before a fantastic audience in Bartın. I would like to share a disappointing incident. We always want to visit schools in the cities and villages that we go as part of our tours; and gather with students so that we may inspire them and instill theater love in them. The seasoned [player] Kayhan Yıldızoğlu is 84 years old and he is the one who wishes these gatherings most. Today, Yaşar Demir, the National Education Director in Bartın first says: ‘Let’s investigate their names,’ and then go further to say: ‘They would make propaganda for referendum at the high school, no pass,’ and they do not let us in a state-funded high school,” Ünsal wrote on his Instagram account. She also said their intention was never to be involved in politics. A referendum on constitutional amendments, scheduled to take place on April 16, will open the way to a switch from a parliamentary system of governance to an executive presidency. President Erdoğan and the ruling Justice and Development Party (AK Party) are pursuing an aggressive policy of propaganda ahead of the referendum.